News: On 23 June 1956 the Abbot Anselmo Tranfaglia opened the Funicular of Montevergine, reversible bicable aerial ropeway, the first in Italy and the second in Europe considering the climb (734 meters). The Funicular, equipped with two carriages with a capacity of 85 seats, travels 1669 meters with a total journey time of 7 minutes and velocity of 4 meters per second. Given the sensitivity of the assistance, the control of the pulling rope (40 millimeters in diameter) has been assigned to Punto Netto Srl, leading company in assistance and quality inspections, especially in non destructive testings in engineering domain. Sixty years after its opening, The Region of Campania alongside with Air, local public transport company, has decided to start an overall review of the structure, about 1270 meters from sea level, as envisaged in sector-specific laws and regulations. As stated, the structure's entire life cycle ends this year. 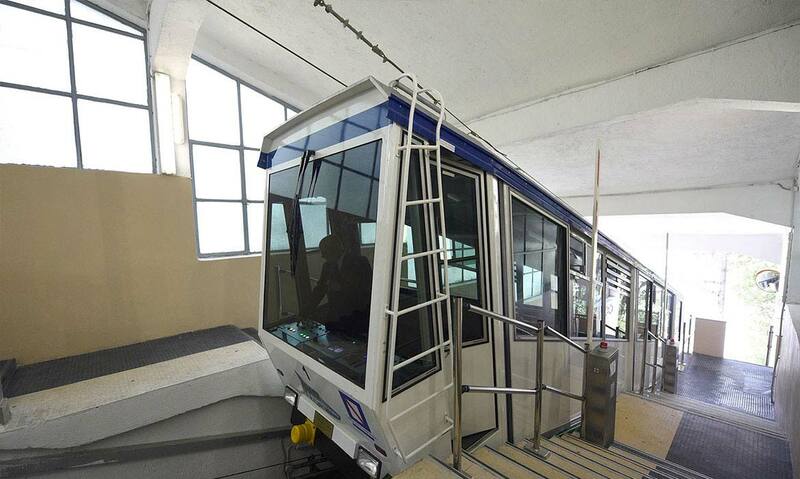 The non-destructive testing on pulling rope of Funicular of Montevergine have been carried out making an accurate magneto-inductive test (MIT). The control has been carried out by a fully-trained technical staff and has lasted just 4 hours. Hence, the transport service has not been provided only for the aforementioned period. The magneto- inductive testing on the pulling rope has been carried out through the use of the Detector AMC_ROPE 60 joined to the data collector AMC_IASH, ables to turn pulses registered on the rope into figures. This kind of control has been required by Ustif, a special department of Ministry of Infrastructure and Transport, authorised to issue security clearance form, strictly necessary to maintain opened the structure. In detail, the apparatus used has provided a relevant track of the chart showing status of the completeness of the rope. Obviously, each track is characterised by a background noise which could depend on shape and diameter of the rope and the strands. The peaks on the track associated with a specific signal-to-noise ratio (SNR) are considered as a relevant defect. The analysis of the amount of background noise allows tracking defects such as corrosion, shape variation, wear and deformation. By the analysis of magneto inductive testing chart joined with visual inspection result, done in top lift station of the Funicular of Montevergine, all in accordance with UNI ISO 4309 – 2011, has been certified that the rope subject of the audit is perfectly in line. All data have been forwarded to Ustif to get the green light to reactivate the service in complete safety. The Punto Netto, constantly attentive to needs and requests of excellences of the territory belonging to engineering domain, has provided a prompt intervention with the aim of not stopping the service, so loved by passengers, particularly interested in the use of the Funicular to reach the Sanctuary of Montevergine. The non destructive testing carried out on Funicular of Montevergine, only one of the interventions to be carried out soon, shows how positive and fruitful is the strong partnership forged by Punto Netto and Air.